My family enjoys lettuce wraps. We usually have them at several places around town. My favorite is the dish served at The Cheesecake Factory. I love the fact that each of the ingredients are separate on the plate and they have amazing sauces to eat with each one that you make. 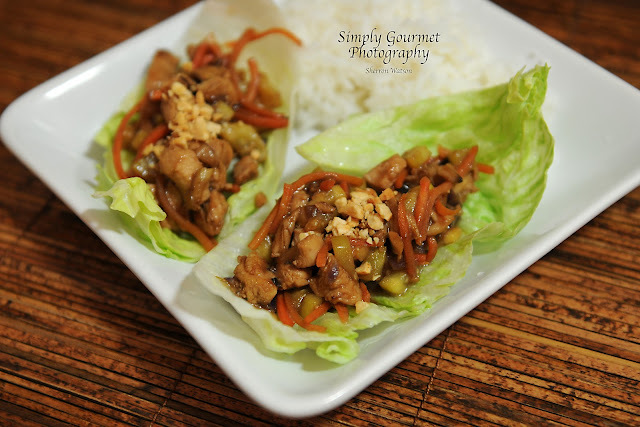 This past week we ate dinner at Lemon Grass. This is a local Thai restaurant in Annapolis and we ordered the lettuce wraps. We could not get enough….they were so good! Unlike The Cheesecake Factory and more like PF Changs, they came to the table with everything finely minced together. I had Rye take some chicken out the night before and we had a fresh head of lettuce . I had a hankering to try and attempt making this dish at home. I always have on hand a combination of oriental sauces: fish, oyster, hoisin, soy, rice vinegar, etc…..We love asian cooking and I try to have all of the necessary ingredients on hand. Messy,but good! 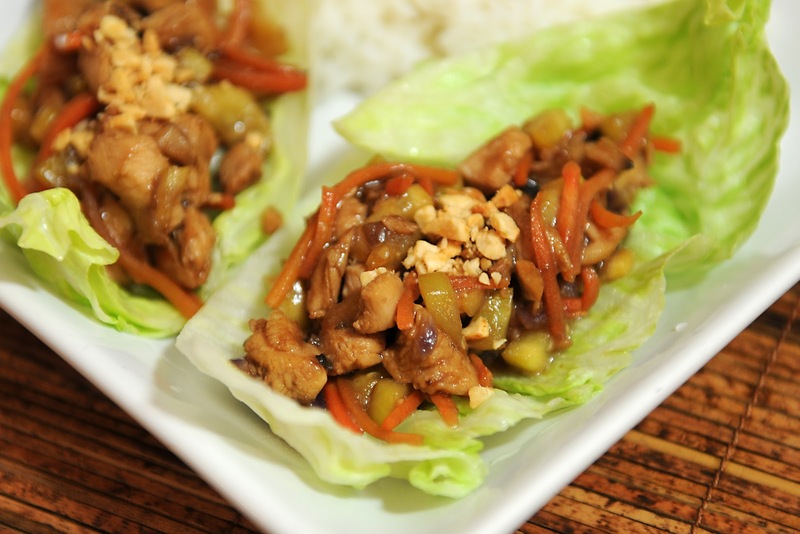 The peanut sauce just runs down your fingers and you need lots of napkins at the table. What I love about this dish is you can really make it your own. You can substitute all types of veggies, sauces, rice noodles, etc and have a unique lettuce wrap each time you make one. My challenge is for you to make the basic recipe and then WOW your guest with all of the accompaniments on the table. Some suggestions would be: water chestnuts, cashews, bean sprouts, julianned cucumbers…..I am sure you are getting the idea. ENJOY! In a medium size bowl add chicken pieces all of the ingredients listed under "chicken". Set aside and let marinate for 15 minutes. This gives you time to dice your veggies. Dice and prepare you veggies according to recipe. 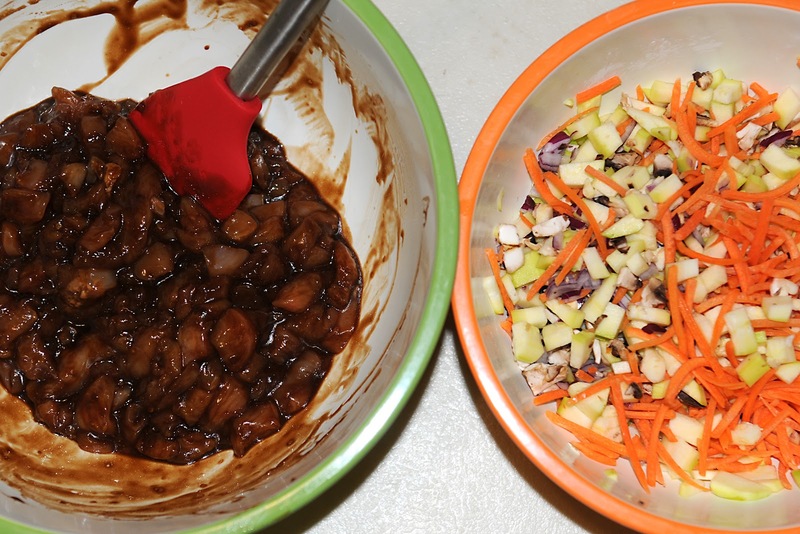 You should have two bowls…one with chicken marinating and one with veggies. In a pan, heat peanut oil and add veggies. Saute for 4-5 minutes. Remove and return to bowl. In a pan, add more peanut oil and cook chicken with marinade. The sauce will thicken a bit and should be watched and stirred so that it does not burn. Once the chicken is cooked add the cooked veggies and stir. Remove from your heat and serve with lettuce chunks. I cut a head in half and then in quarters. I removed the very center parts and left the darker green parts of the lettuce. I added all of the ingredients to a microwavable bowl, heated for 30 seconds , stirred and served. It was tasty, easy and went well with the wraps. These look wonderful, and easy, will have to give them a try!